If you haven’t yet caught on to the social media sensation that is #coronationchickenquest I think it’s high time you took a good, hard look at yourself in the mirror with a view to reprioritising your life goals. With our expert sense for capturing the mood of the city, not to say the nation, Lunchquest has embarked on a radical and critical re-examination of the much lamented dish that draws its origins from the coronation of Queen Elizabeth II. A simple dish of chicken, curry spices and mayonnaise (or yoghurt or crème fraiche), the recipe is often augmented with the addition of sultanas, mango (or mango chutney) and flaked almonds. Given the reaction to our initial social media mentions of it, it seems to divide opinion like virtually no other dish I can think of except Marmite. 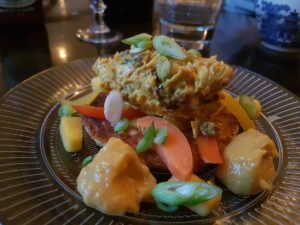 Whatever the case, we have already seen many people rise to the challenge of delivering the best possible coronation chicken dishes to entertain our palettes. So far we have sampled dishes that rate from 1 star to 5 stars. An exquisitely presented dish combining all the classic elements of coronation excellence with a few innovative colour and texture twists, this featured a quenelle of chicken atop a light pancake with beautifully crisp vegetables and soft mango. It was absolutely outstanding. Edinburgh hospitality businesses will need to do exceptionally well to match it. This was a custom request in new tapas and cocktail bar Chameleon’s first week of trading. Served with an apricot gel, this marked the start of highly innovative chicken dishes with the coronation meat used in lieu of the usual sausage in a belter of a scotch egg. Joanna Goodbite is a pretty reliable sandwich shop just near Strathclyde University’s main campus buildings in Glasgow. I accidentally added salad to my sandwich which was a total error, but it did contain good, fresh chicken encased in a crisp morning roll. It was a really decent effort. This was a pretty rudimentary sandwich with very ordinary bread. It was heavy on mayo and raw curry powder. It hinted at why people don’t like the dish, but was still not actively unpleasant. So, this is why people hate coronation chicken! The Co-op’s deli selection tub of coronation chicken was seriously unpleasant. In some senses it was a relief to finally encounter something that was so thoroughly ghastly that it started to explain the ferocity of certain reactions to the mere mention of the stuff. It looked and tasted like partly digested Christmas pudding flavoured Angel Delight that had been vomited back up. It was a truly awful concoction. So the gauntlet has been firmly thrown down by the excellent kitchen teams at The Dogs and Chameleon, both of whom showed splendid innovation in responding to the challenge. It has also been shown how badly the dish can go wrong. Over the next couple of months, we plan to compile the first ever Coronation Chicken 100. Why bother simply finding the best one when we can so easily – with a bit of intestinal fortitude – explore the good, the bad and the ugly? How will you rise to the Coronation Chicken Quest Challenge?